The Football Front: Spain: 4-6-0 formation: A revolution in the making? 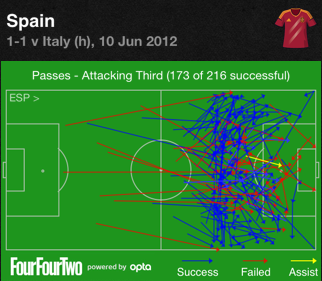 In his debut article for The Football Front Thomas Payne evaluates Spain's 4-6-0 formation. The eventual winners Spain were criticised recurrently during the recent European Championships for their lack of goals considering the plenteous and lengthy spells of possession as well as the quality of their team. La Roja's tiki-taka football was branded as "boring" by the media, due to the lack of chances created in the final third. The predominant reason for their 'dull' football was their formation, as Del Bosque used a formation similar to a 4-6-0, with Fabregas being (on paper) their highest position player. Despite being listed as a striker in this formation, the Barcelona midfielder played a false 9 role, in which he dropped deep into midfield, meaning that Spain were without a forward quite often throughout matches. This innovative system allows teams to dominate the midfield, as you'd expect with 6 midfielders and supported Spain's aim to control matches with possession. However, since they sacrificed playing a striker to dominate more of the middle of the park, the long spells of possession that they had rarely had an end product. This was due to the fact that there was no one to receive through balls into the final third, since the forwards played a lot of the time deeper alongside the trio in the middle of the park. The birthplace of many tactical innovations is Italy, this great footballing nation is the home of the libero, the regista, and is where Lionel Messi's role, the false 9 was created. The latter of these positions was actually invented in the 4-6-0 system, at AS Roma by their manager at the time, Luciano Spalletti. Unlike Spain's 4-6-0, this formation was used for counter-attacking purposes, as the Italian side looked to score on the break through their men on the flanks. Spalletti was somewhat forced to invent this formation, due to a lack of strikers during a small injury crisis at the club and it brought them success, and despite the forwards coming back from their injuries, Spalletti continued to use this system. Could it Work on a long Term Basis? Within both examples of teams playing a 4-6-0, they used the formation temporarily. It was Spalletti's solution to an injury crisis, whilst Del Bosque only used it in the European Championships. We have yet to see a 4-6-0 be effective throughout a long period of time. The reasons to the failings of this formation lies up front, without a striker teams can dominate the possession stat, whilst creating few chances. There is no forward to make the runs behind the defence, to serve as an outlet for the through balls of Silva, Iniesta, Xavi, and Alonso. This problem was exposed in La Roja's opening match against Italy, despite having 66% of the possession, they only scored one goal. This goal came from a run from deep and behind the Italian defence, something which they lacked throughout the tournament. As you can see in the diagram, most of Spain's passes in the final third were short, and there aren't many through balls, which resulted in a lack of chances created for the side. To counter this lack of penetration, the wingers need to be good goalscorers, like Mirko Vucinic in Roma's system, the Montenegrin was positioned on the left flank by Spalletti despite being a natural striker, where he now plays for Juventus. On the attack, the side also has to get numbers forward. The front three should always be in advanced positions when their team is putting pressure on the opposition. This means that there will always be players making runs from deep and looking to make themselves available for the piercing through balls supplied by their teammates in midfield. The 4-6-0 is a good formation for both counter-attacking and possession football. The compact midfield allows you to sit deep without giving the opposition too much space to work with, this also allows for quick and short passes to move the ball upfield, since every player is in close range of each other. Like in the Roma side, the wingers need to be competent goalscorers to make sure you don't lack too much firepower up front. The two central midfielders also need to support the attack to make sure the players up top don't get isolated, whilst the holding midfielder behind them can either play as a destroyer (if you're in a counter-attacking side) or a regista if you're playing possession football.